The Social Security Administration has just released its annual data on all the names given to babies last year. Besides revealing the nation’s most popular names of 2010 (Jacob and Isabella), the files are loaded with details about all the unusual names people give their offspring, from Lazer (the given name of 20 boys) to Symphony (86 girls). Pop culture definitely influences people’s picks—Isabella is the hero of the Twilight series; her nickname, Bella, has gone from being the 259th most popular name in 2004 to the 48th in 2010. What about politics? Does it have any influence on baby names? To find out, I searched for incidences of the following names between 2007 and 2010: Barack, Palin, Malia, Sasha, Track, Bristol, Willow, Piper, and Trig. Each of these names is distinctive enough that any changes in their popularity after 2007 might be partly attributed to parents intentionally naming their kids after Barack Obama, Sarah Palin, or their kids. Sure enough, all of those names saw big bumps in 2008 and 2009. 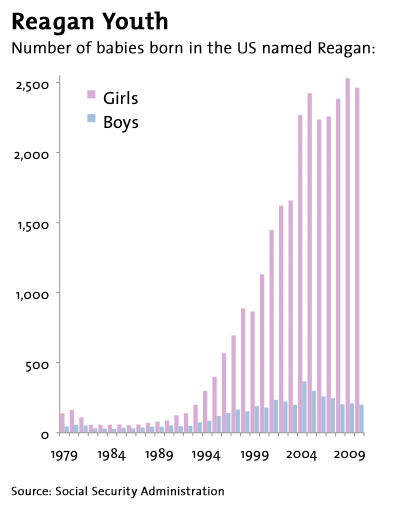 In 2007, fewer than 5 boys were named Barack; there were 52 in 2008 and 69 in 2009. 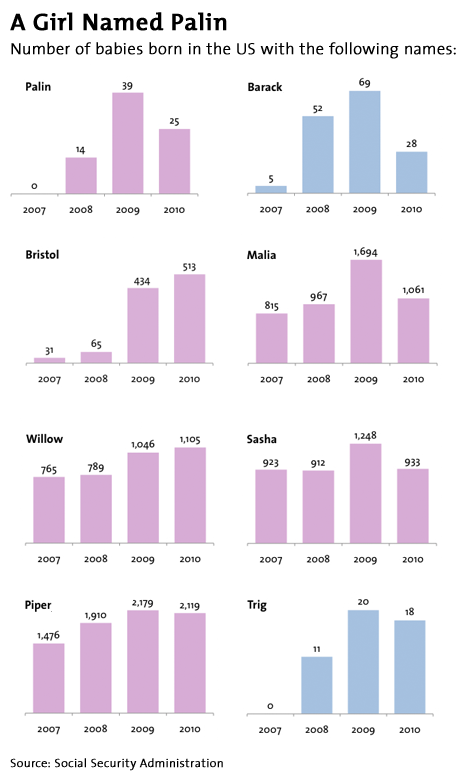 In 2007, fewer than 5 girls were named Palin; in 2008 there were 14 and in 39 in 2009. Likewise, all the Obama and Palin kids’ names saw significant rises in popularity after their namesakes entered the limelight (except Track, which didn’t show up at all). I won’t speculate on what the trends for Sasha and Malia (both peaked in 2009 and fell in 2010) versus Bristol (still climbing in 2010) suggest about the political fortunes of the First Dad or the Grizzly Mama. But their names would certainly be even more popular if they dated vampires. Update: For added perspective on this, I looked up the name “Reagan”—another unique political name that has become fairly popular. Last year, it was the 127th most common name for baby girls, up from 950th in 1993 and 923rd in 1980. What’s interesting about the Reagan bump is that it occured entirely after Ronald Reagan left office. When he was sworn in 1981, the number of girls with this rare first name dropped 50 percent (there was a 40 percent drop in the occurrence of this even more obscure boy’s name). The numbers stayed at that level until the mid-90s, when suddenly a whole new generation of little Reagans showed up. What could explain that? Reagan nostalgia, stoked by the Clinton years? Perhaps, though the name really took off during the past eight years or so, after Reagan’s death. Maybe parents find overtly political names too risky until the namesake has left the scene and his or her reputation is secure. Last year, more than 2,600 newborns were named Reagan.